One of the biggest surprises I've had on this trip has been the openness, kindness, and generosity of people I don't know. I won't call them strangers, because it seems too harsh a word. The SIR 9 upon entering Wyoming... The bike itself attracts curious passers-by. Despite the somewhat heavily traveled continental divide, I've been surprised how many people strike up a conversation with me simply based on the appearance of my bike. 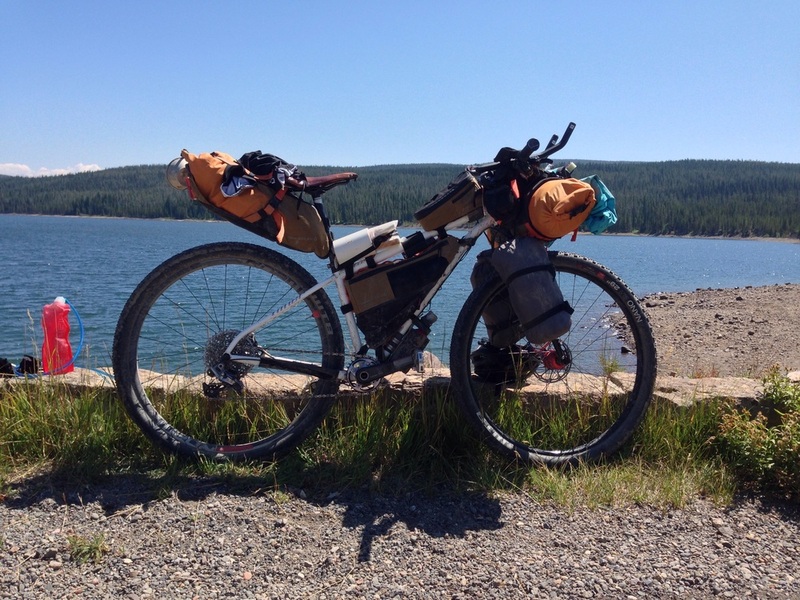 I have to remember that Bikepacking is novel to many people, and to whom it's not, they are excited about it. So just that in itself open doors. And there were times when I really needed some open doors. I won't name them all now, but I will talk about a few... Just so you get the picture. There was Dan and Lani in Helena, Montana. After being beaten into town by a pace line of Dutch riders (otherwise known as "Team Holland"), Jeni and I were looking for a bike shop that sold Platypus bladders, because I'd gotten a hole in mine. Dan at Great Divide Cyclery (406-443-5188) answered the phone after hours, and told me to come by anyway. Jeni and I explained that we hadn't found the campsite yet. Dan (the owner of the shop) explained that the site was miles out of town, and the couple offered up their backyard, and then their spare bedroom for us to stay the night. 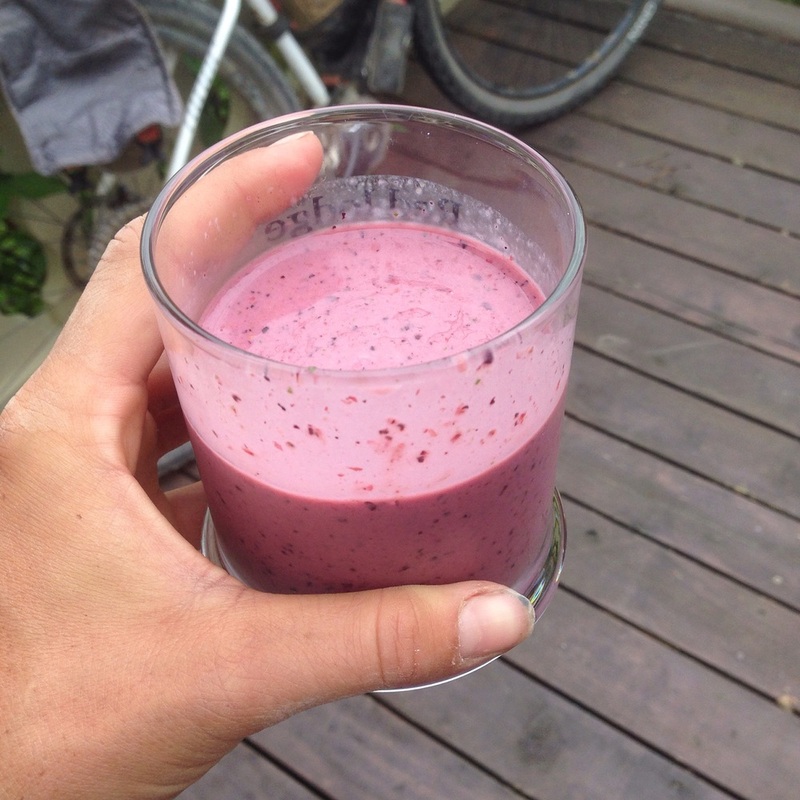 In the morning, Dan let us do a little bike maintenance on the deck and he made us smoothies. UNREAL. Supposedly the secret is good Greek yogurt. I should mention that 2 other people in the town of Helena offered us a place to stay as well after they heard we were bike touring. Something is going on in that town. Then there was Casey who worked with the Centennial Outfitters whom we met in at Jan's cafe in Lima over breakfast (yes we are there for dinner the night before too). He advised us on back road conditions after a huge downpour, and gave us the number for the lodge along the way. We followed a rainstorm for 30 miles then finally called it quits. Turns out, it was the rainiest, muddiest day that we ever had. We stayed the night at the Centennial Lodge, were given a dinner, and Seth (a 13 yr old cowboy) basically tended to all our needs and told us all about outfitting. Casey helped us get a jump on the next muddy section of road the next morning, and we were able to do 85 map miles in only 70 miles that day. (Jeni and I were on a tight timeline to get her to Jackson in time for her flight home.) He was going that way, but took the time to get our bikes on the truck. 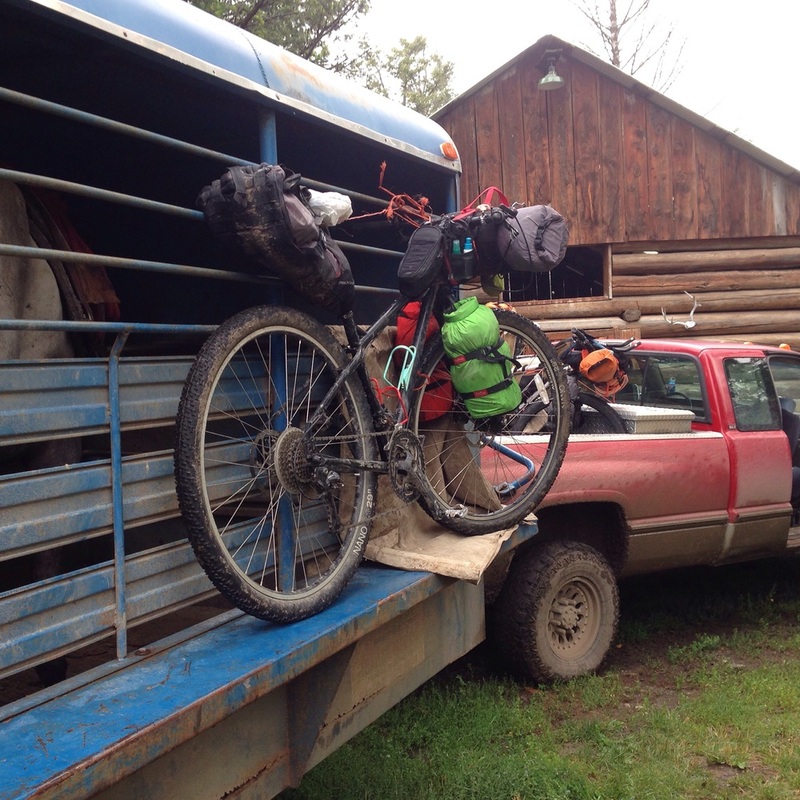 Jeni's bike tied to the horse trailer and mine in the bed of the truck. The second to last day of her trip, Jeni went rubber side up on a gravel descent. She bit the gravel pretty good, got a mild concussion and a bunch of deep wounds. Luckily, we were riding with 4 other riders at the time (we were going through the grizzly relocation area... safety in numbers), so there were plenty of people to help. A car of vacationers took Jeni the 10 miles to the nearest establishment. 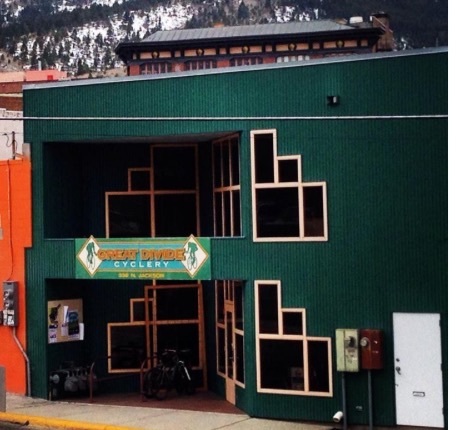 After much figuring and some cursory check up work by the forest rangers, Jeni and I decided to get down to Jackson, Wyoming that night to have access to better medical services. There aren't many pictures of her wounds becausewe had so many other things to think about. Namely, Jackson is one of the most expensive mountain towns I've ever been to, and we had nowhere to stay. We were just booking a very expensive hotel room when I proposed we wander into town to get some food and see who was around. Literally the first people we run into start asking us about our bikes and what we are doing. 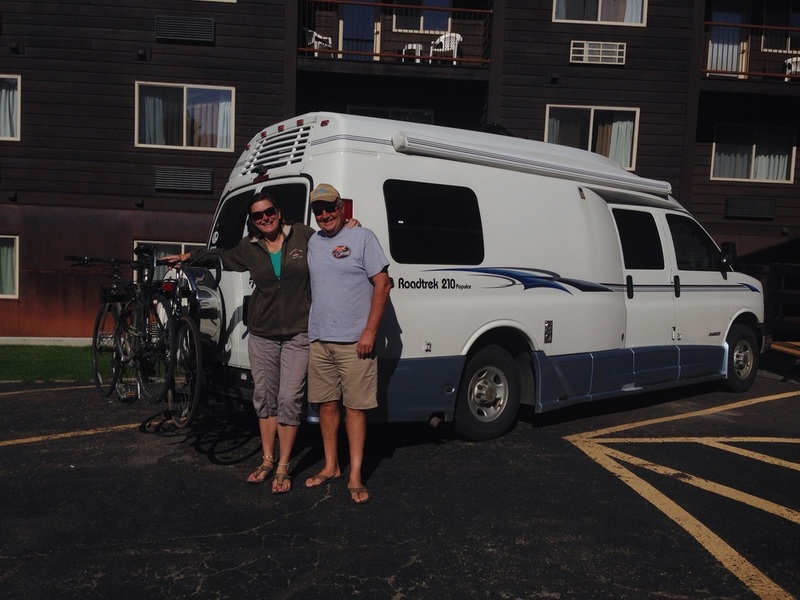 When they heard about Jeni's accident, they pretty much immediately offered up their vacant RV and hotel shower. Turns out, they'd done some bike touring themselves and Ann had been in a bike accident the year before. They went above and beyond what most people would probably do on their vacation... They gave us a free place, a warm shower, and a sense of comfort. The Green Berets are cycling across the country to raise money for PTSD. In more recent history, a new cycling buddy from Philly has joined me on the Wyoming leg of the trip. Damien unfortunately aggravated his Achilles on the first day. We stayed in a lodge for a whole day to give him a chance to heal, but then decided to press on the next day. The plan was that I would ride to the top of the pass, and Damien would get a ride to spare his Achilles. Turns out, it was rough trying to hitchhike with a fully loaded bike. After 3 long, demoralizing hours, a cyclist came up the road. He was a green beret, and was cycling the county to raise money and awareness for PTSD. Not but a few minutes before a super cool sag wagon with a open spot on the bike rack had ridden by. Fortunately for Damien, the sag wagon turned around and gave him a lift not just to the top of the pass, but to the lodge where I was waiting for him. They were a huge help in getting Damien back in the bike. Then there are your regular bike trail saints, who offer up a cabin for cyclists passing by. These peoples are not totally uncommon. (Although always appreciated!) to give you an idea, an ACA map side is about 200-250 miles per side. On each map side, you'll pass about 2 houses hat have opened their doors or cabin to cyclists. John and Lucky Fandek are one such couple. Their tiny cabin fits a couple comfortably, or a pair uncomfortably, or a couple at odds uncomfortably as there is one bed and some floor space. I should have a picture gallery just for their cabin but I don't have time for that. We talked to John and he said he gets about a half dozen people every year to stay. 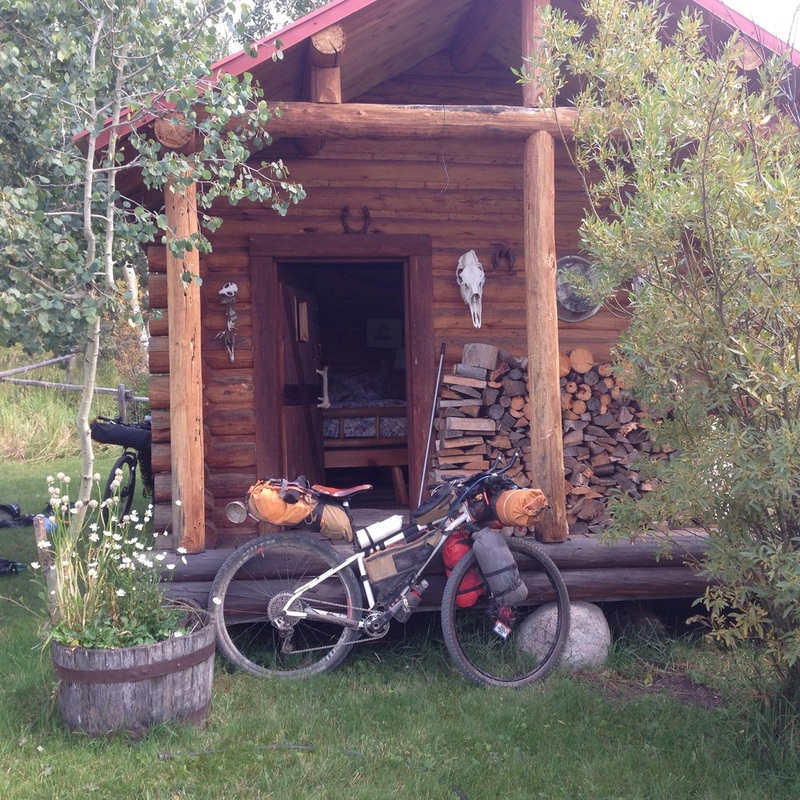 The Niner in front of John and Lucy Fandek's cabin. And so to everyone who has helped me along my journey so far... THANK YOU! The media says the world is full of dangerous and crazy people, but the world so far has shown me that the good guys are outnumbering the bad guys.